This bi-annual sale gives us the opportunity to bring new machines into our classroom and sell current models at a discounted price. It’s a win-win-win for us, our students who use our classroom, and our customers looking to purchase a machine. 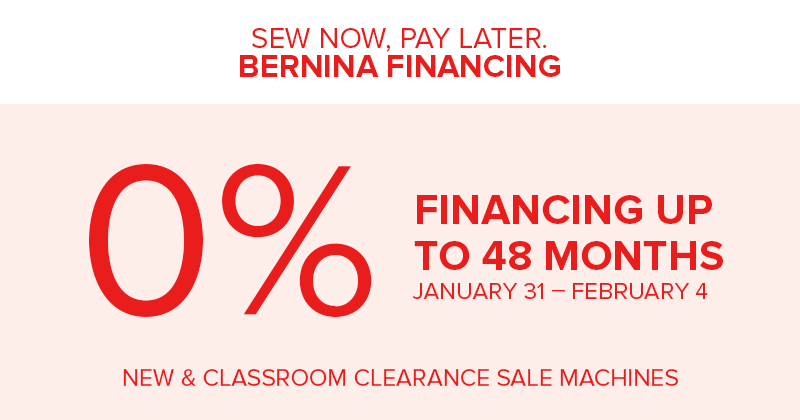 Classroom models come with the same benefits and warranty as a new BERNINA. They also include Machine Owner Classes and additional discounts on accessories, fabric, notions, and tools on your day of purchase and on Machine Owner Class days. Purchase a Classroom 570 or 590 and get a serger for $799! We’ve selected the best and most useful combination of machines to have in our classroom to cover all types of sewing. Bring our MD studio into your home by bundling up machines into one machine dream team! 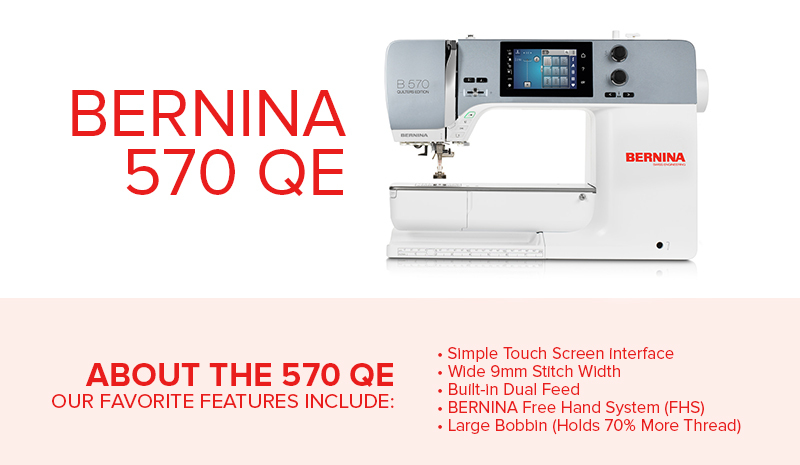 Purchase a 570 QE or B 590 and receive an extra discount on the Classroom L450 Serger. $799 with purchase of 570 or 590 (MSRP: $1299). We rarely have the opportunity to offer, classroom AND preowned machines. But we’ve got options for you! Home delivery also available. We’re proud to offer 6, 12, or 18 month 0% financing everyday. Interested in longer terms? January 31 – February 4 get 0% financing for 48 months! Preordered machines require a 30% deposit. Machines will be available in 6-8 weeks. Limited to stock on hand. Contact us for pricing, information on deposits, and 0% interest financing opportunities. All blog comments will be replied to directly via email. Thank you. I was interested in your prices for the classroom 570QE. Thanks! I am interested in prices for the classroom 570 or 590 models. I’m interested in pre-ordering one of your classroom sergers. What is the easiest way to arrange that purchase? Can I get a price for the 570 QE or 590 classroom models please? What is the 570 price. ? Do any of these have the stitch regulator when the feed dogs are dropped? Thanks for reaching out to us. Yes! Both the BERNINA 590 and 570 QE come with the BERNINA Stitch Regulator (BSR). They are great machines to transition from piecing to free-motion quilting. Take a look at this video for more information about the BSR, or be sure to contact us if you’d like more information! I’m interested in your prices on the 570 and 590. Will they be given a tune-up before being sold? Thank you. Great question! All machines are serviced by our technicians and come with a full new machine warranty. Thanks for checking! Hi Suzanne, thanks for asking! We’ve emailed a quote with machine pricing for you. 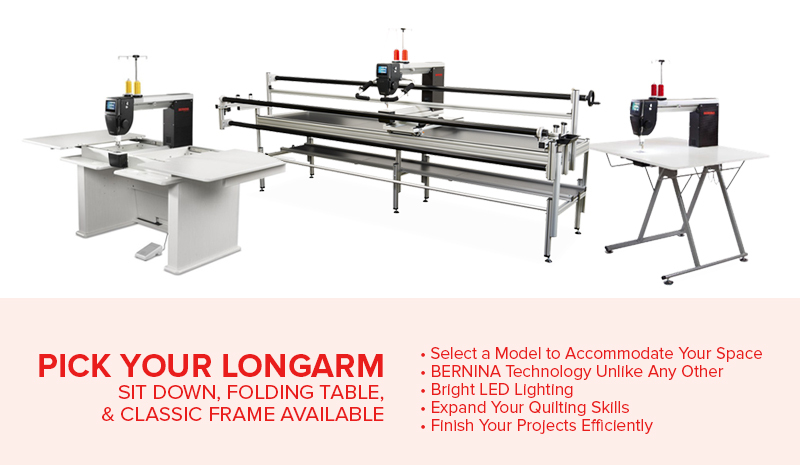 The BERNINA warranty is 20 years mechanical, five years electrical, and two years circuit board, along with one year parts and labor at Modern Domestic. How much are the 570’s, how does the 58 month financing work? Is there a warranty? Thanks for checking in! We’ve emailed you a quote with machine pricing. 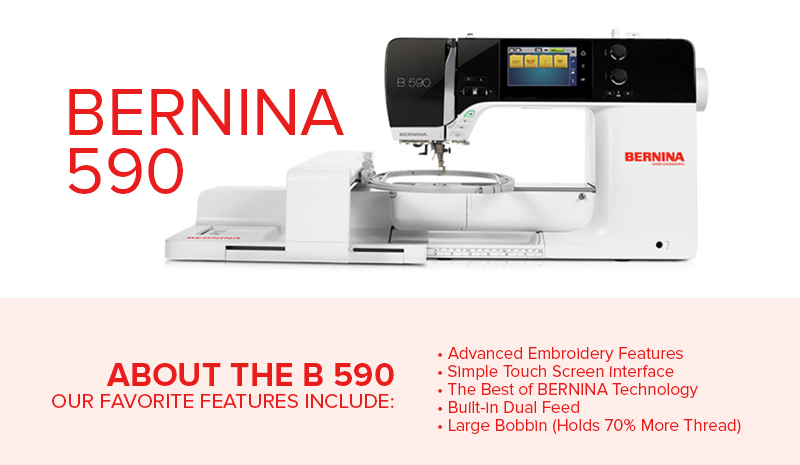 The BERNINA warranty is 20 years mechanical, five years electrical, and two years circuit board, along with one year parts and labor at Modern Domestic. 0% interest financing is available for 48 months. This offer ends February 4. You can apply for financing here, or visit us in-store and we’ll help you!